Louai Almasri is a driver for the region’s largest bus operator and takes thousands of people to work, school, college and leisure activities every single day. In Syria he was a veterinary surgeon and often drove between the three farms that his family owned. 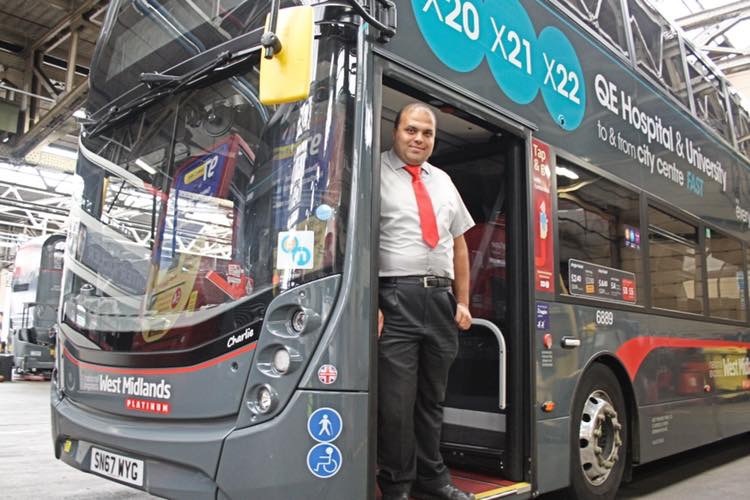 As well as helping bus passengers get to their destination, 32-year-old Louai also looks after his brother, who has learning difficulties, and his father, who is unable to walk. On top of that, he also volunteers his own time to help other refugees settle in and become part of the community. Every Saturday, Lozells Methodist Church provides a safe space for refugees to seek help with resettlement. Louai regularly gives up his time to help them fill in forms and understand the societal differences between Syria and the UK. Reverend David Butterworth said: “Lozells Methodist Church offered to host Syrian Muslim children and families, helping them to become involved in the wider community and to offer something back to kind-hearted Brummies. Louai said: “In Syria I grew up with animals on our family farms and I studied at university to become a veterinary surgeon, but driving has always been a passion of mine. “National Express has been so supportive of me since I joined the company last year. The flexibility of hours allows me to look after my family and attend appointments but it also gives me the opportunity to volunteer and help others. In June 2012, Louai’s home in Syria was bombed, sadly killing one of his brothers and injuring another brother and his father. That same day, they fled the country and walked hundreds of miles to seek asylum in Jordan. After this terrible ordeal, Louai spent three years in Jordan, feeling like he had lost everything and was unable to achieve anything. He then sought other opportunities and was offered resettlement in the UK. In December 2015, he arrived with his brother and spent the first six months learning English and improving his job and interview skills. His mother and father also now live with him in Birmingham. Louai worked as a customer service advisor in a bank before applying to become a driver at National Express West Midlands in March 2017. Following training and a driver assessment, he started driving and hasn’t looked back since. Based at the operator’s busy central Birmingham garage, he currently drives the 14, 60, 97 and X70 routes. He says he enjoys it so much, he’s not sure he’ll ever go back to a veterinary career, which was his original plan when he came to the UK.